Sons of Steve Garvey: Adrian Beltre, Future HOFer? Rangers third baseman Adrian Beltre's greatest strength also happens to be his greatest weakness, at least in terms of assessing his Hall of Fame credentials. He plays the game so smoothly, so efficiently that he's occasionally easy to overlook even after 18 seasons of playing at such a high level. That's why what happened in Arlington on Monday night was so outside the norm. If it prompts people to pause and put his greatness in context, even better. It was one of those games that will resonate through an entire sport. 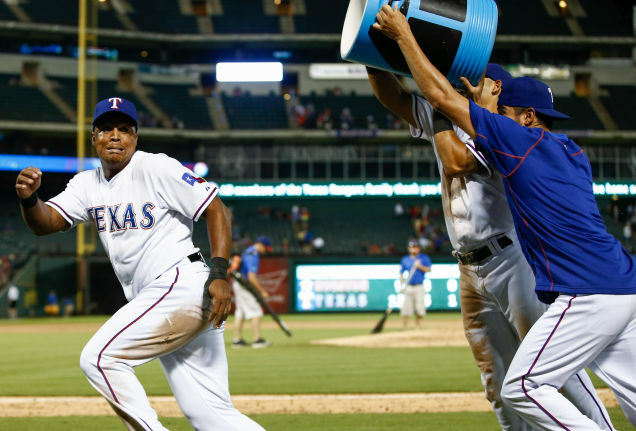 Beltre became just the fourth player to hit for the cycle three times as the Rangers beat the Astros, 12-9. And he did it in five innings: First-inning triple, second-inning double, third-inning single, fifth-inning home run. Let's say right up front that Beltre has methodically built a Hall of Fame resume. There's actually not much debate about that. His career Wins Above Replacement, according to BaseballReference.com, is 36th all time at 80.7. That places him fifth among all third basemen. Only Hall of Famers are ahead of him: Mike Schmidt (106.5), Eddie Mathews (96.4), Wade Boggs (91) and Brooks Robinson (88.4). His career WAR is higher than a long list of Hall of Famers, including Joe DiMaggio, Johnny Bench, Reggie Jackson and Derek Jeter. Counting the players who spent most of their time at third base, Beltre is fifth all-time in hits, home runs and RBIs. Defense? Those metrics are sometimes trickier, but his defensive WAR is second all-time among third basemen, trailing only Robinson. I was hoping you wouldn't see that, Sax, since I know it hurts you the most. Anyone else have a problem with the article listing off Jeter as a Hall of Famer and not a potential Hall of Famer? He hasn't even been retired for a full year yet. And the loss of Beltre still stings here as well.